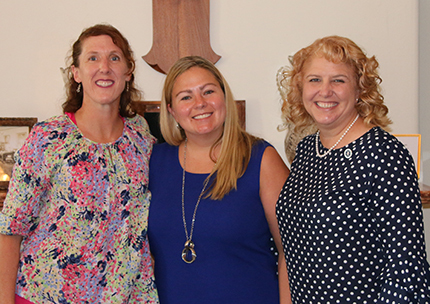 Carina Stout (center), with companion Carmen Ferguson (left) and Director of Associates Chanin Wilson, welcomed the call to become an Associate in Mission after a walk on the Motherhouse grounds. One of the women who made the commitment to become an Associate in Mission to the Sisters of Charity in 2018 is Carina Stout, a woman who seeks to share her skills through service. Through her work with Everybody Counts, Carina is honoring her commitment of service with an equalizing love for all people. Carina became aware of the opportunity to become an Associate to a religious congregation through her mother, a lifelong Associate with the Sisters of St. Francis in Oldenburg, Indiana. While she adored her mother’s commitment to the congregation, Carina made the decision to become an Associate to the Sisters of Charity after a brief walk on the Motherhouse grounds. “I felt such peace, and knew this is where I belonged,” she says. “So I reached out to Director of Associates Chanin Wilson for more information.” Her discernment process was guided by Carmen Ferguson, a fellow Associate in Mission and Tri-State Area Associate Regional Representative. 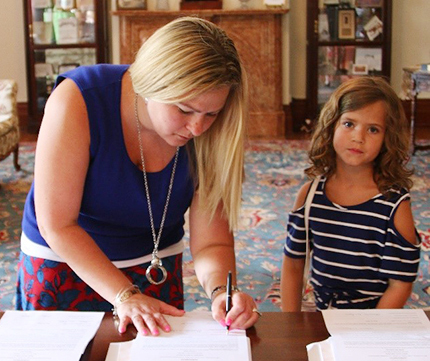 In June 2018, Carina finalized her commitment to the Congregation during a ceremony in the Motherhouse chapel. Most of her service has been comprised of working with children, as she states that it is what she is most passionate about. She honors this passion through her volunteer work with the Everybody Counts program at C.O. Harrison Elementary School in Cincinnati, Ohio. The program aims to bring awareness to the disabled in the community by explaining that everyone, regardless of limitations, has the same intrinsic value. Carina revived the school’s Everybody Counts program and its services two years ago. Though she has recently returned to a full-time work schedule as a driver manager for a trucking company, this has not prevented her from serving the program as a committee chair. The steady tradition of faith in her family encouraged her commitment, but sharing her faith and values with the Sisters of Charity Community is what she is most excited about. Specifically, she is looking forward to, “Being connected with others who share the same vision and charism,” she says. Having connections with others is made simple because of her easy access to the Motherhouse, since she only lives about five minutes from Mount St. Joseph. As an Associate, however, she feels that the Sisters of Charity follow her in spirit wherever she is.